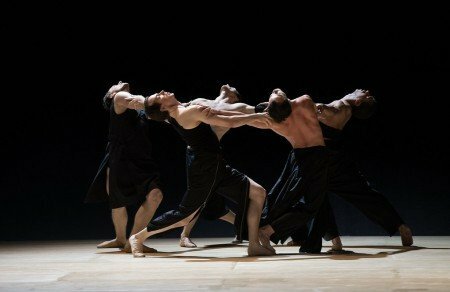 Obsidian Tear by Wayne McGregor was half of a double bill that also featured resident choreographer Jorma Elo’s Fifth Symphony of Jean Sibelius. The theme of Finland (Elo’s native land) was established right off the bat with a performance of Sibelius’s tone poem Finlandia, and then the focus shifted to McGregor’s creation, a co-production with the Royal Ballet. 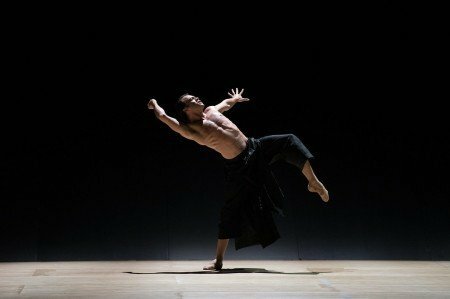 In this reviewer’s opinion, Obsidian Tear was carried squarely on the shoulders of principal dancer Paulo Arrais, who created and sustained a riveting, albeit disturbing, character. From the first moment he appeared onstage his whole body was tensed — ready for a fight. With his chin tucked under, he was constantly assessing the other men onstage, trying to figure out whether they were worthy of fighting him. Mostly, he seemed to say, they were not. Arrais’s lines were particularly beautiful: stretched out, precise, expressive of machismo and anguish. There was a moment when Arrais did some contractions that looked as if he was being electrocuted. It reminded me of American Ballet Theatre alum John Selya in Twyla Tharp’s Movin’ Out, which I saw many years ago and never forgot. When Selya saw his girl with another man, his body reacted as if he’d been shot at close range. Arrais had that same look – and it was stunning. 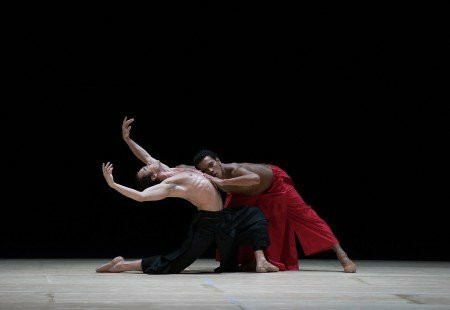 There was a quite a bit of side-by-side dancing between Arrais and the character dressed in red, played by Irlan Silva, who eventually becomes a sacrificial lamb or Christ-like figure. The latter is bullied by others onstage and eventually Arrais’s character pushes him off a precipice — shades of Swan Lake. Overcome with guilt and remorse, Arrais, elbows bent and fists before him, contemplated his hands in much the same way that Onegin does after killing his best friend in a duel. Other men onstage tried to console him, although I couldn’t figure out why since Arrais’s character was guilty; the man in red did nothing to provoke the violence against him. It may be that the murder was some sort of primitive ritual as in the Rite of Spring, but there was no way to know that. In any case, Arrais refused to be comforted, and at the end of the piece he jumped off the precipice himself. More echoes of Swan Lake – though you didn’t get the feeling he was motivated by any desire to be united in death with his victim. This was a second tour de force for Arrais. The first was his Onegin last March in which he presented Pushkin’s anti-hero in such a way that every move was not only thoroughly analyzed and motivated, but also performed with absolute conviction. There he showed his ability to present a character in a story ballet, and in Obsidian Tear he brought much of the same sensibility to a contemporary production. Fifth Symphony of Sibelius by Elo is set to music that the choreographer has described as the national anthem of Finland. The most famous part of the symphony is the swan theme in the third movement, and one was hoping the dancers would evoke swans at that point, but it didn’t happen. When the theme was heard, the company (there were over 30 dancers participating in the piece) raised one curved arm then the other above their heads in a very Balanchinian posture – so Sibelius’s vision of swans in flight did not seem to be mimicked by the choreography. It was a relief that the spastic motions that often appear in Elo choreography did not make an appearance in this piece. Perhaps his reverence for the music led him to choose a more traditional neo-classical style. In any case, the movement of groups around the stage clearly evoked such Balanchine works as Symphony in C.
There were three pas de deux, and in the first two Misa Kuranaga and Kathleen Breen Combes attained several beautifully stretched-out positions, some of them reminiscent of Odette. It was Lia Cirio, however, who proved herself first among equals with an astonishing balance and promenade. The move started in a developpe a la seconde, with her partner, Paul Craig, supporting her with one hand. Then she tilted herself until she was substantially off-center — still with only one-handed support — while her partner leaned in and promenaded her in a single rotation. It seemed to defy the laws of gravity. Cirio had this to say about it: “Jorma [Elo] said to us, ‘I want something that looks extremely difficult,’ and that’s what we came up with. It is extremely difficult, but when we get the right amount of counterbalance, it clicks and works perfectly.” This move reminded me of one she did in Balanchine’s Stravinsky Violin Concerto last May in which her partner, John Lam, promenaded her while he was in a crouching position and she had one leg wrapped around his neck. One could hardly believe one’s eyes. In addition to her strength and control, another of Cirio’s virtues is that she never telegraphs that she’s doing anything out of the ordinary. Although her athleticism apparently knows no bounds, she seems completely unimpressed with herself – and that makes it even more shocking when she does something superhuman with no warning or fanfare. Ashley Ellis got top billing in Elo’s piece, but did relatively little dancing. There was no pas de deux for her; she came onstage periodically, danced for a short time, and then left. What a disappointment. On the other hand, her character was interesting in that she seemed to be a sort of motivating genius who set other dancers in motion – and she consistently looked bird-like. Since Ellis is one of the greatest Odettes on the planet, this was welcome, as was her happy demeanor. One thing that confused me is that she sometimes put her hands in front of her mouth. Since the swan theme is supposedly the sound of birds calling to one another, you’d think Elo would not want to impede her ability to vocalize. Maybe he was drawing attention to the place where her voice would emanate from. In one of Ellis’s more memorable, if perhaps less dignified, moves, she lay on her back and pedaled her legs. It made her look like an upside-down swan – or one seen from underwater. The audience certainly never sees Odette from this perspective. Can you imagine that tragic bird paddling like mad underwater to propel herself forward? It boggles the mind, but maybe that’s not such a bad thing.